I bought this set to stage a home for sale. I loved it so much I decided to keep for myself. Very full comforter. The hues are subtle and able to be used in a variety of colored rooms. Elevate your decor with this elegant comforter set. A set of cotton sheets provide a soft texture, while the microfiber comforter ensures cozy warmth. The stripe pattern features calming tones for a modern, stylish addition to any decor. The set is machine washable for easy cleaning. This is a great set for your money. The colors foul you a bit though, the description says, black, gray, taupe and tan. When actually what appears to be the black is really a very dark green. The sheets are a woven design of black. It does look very nice. But the comforter doesn't appear to have any black in it. Colors true to the picture...works perfectly with the antique white walls. Bought this for my son's bedroom, soft colors but still masculine enough to work for him. Comforter feels soft-have not used the sheets yet. I long for the day when someone will make California King fitted sheets that actually fit the bed. A little extra fabric would go a long way. That being said, the comforter and pillow shams are nice. Nice little pattern for a single guy. Not too girly, not too man caveish. The sheets are pretty sturdy, as they should be since you have to stretch the hell out of them to get them over the mattress, and they are some what soft, but really doesn't look good when you can see part of the mattress because they are not big enough. 99% of Cali kings have a pillow top. Start taking that into consideration on the fitted sheets. The quality was great however the color of the "gray" that fades into the black has a green tone so did not work with my color scheme. Pictures do not do this justice. Beautiful soft silky material for comforter. Very well made set. Includes 2 pillow cases, 2 pillows shams, 1 accent pillow, bed skirt, comforter & sheet set. This bed in a bag was complete. sheets, pillow cases, shams, skirt and pillows. very pretty on the bed. Went with my decor perfectly. Cute, comfortable, &amp; durable. Love this set. These pictures are after a year and half of use. The sheets are comfortable and I have machine washed/dried the comforter many times and it is still in great condition (also survived college with me). The throw pillow and shams make the set come together. It’s a very original design- I get compliments on my bed all the time. Probably the happiest I’ve been with a purchase for the price. The comforter is a nice weight for a hot to cold climate. I'm able to add a blanket for cold winter months to be comfortable. And, it's light enough for the hot summers. I like the colors and the added shams and decorative pillows. The sheets are very thin, so am not sure how they will hold up. 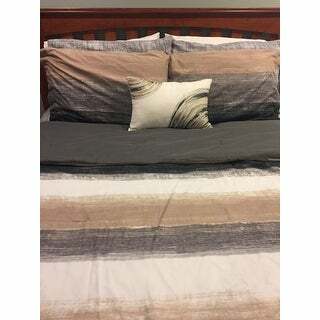 This comforter and sheet set is beautiful and fits very well on my kind size bed. There isn't a lot of overhang on the comforter or top sheet, so don't plan to tuck this in. 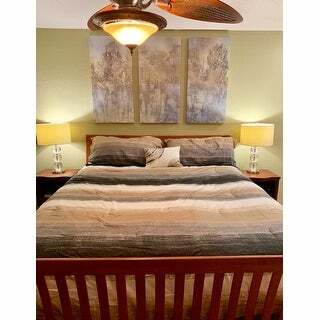 Such a nice looking comforter set. Colors are pretty true to picture and great quality! I love this set! Soft material, great quality., quick delivery. Very nice quality. Outstanding appearance. Good value for the money. Love it good quality !!!! Everything you need for a GREAT price! Great quality and colors, easy to match any accessory! I would recommend this bedding set to anyone! This comforter set looks perfect in our guest bedroom - colors/pattern/design Bought this comforter set to also match the Veratex Dean Bath Collection (fall leaves, neutral colors) It certainly makes for a beautifully designed guest bedroom - Highly recommend!! "Are there curtains that match any of the colors in the comforter in the collection?" Unfortunately no, there are no matching curtains for this. "The description says it has an olive green color in it, but it looks more grey to me. Is there any greenish color or tint to it?" It does have Olive and Grey. 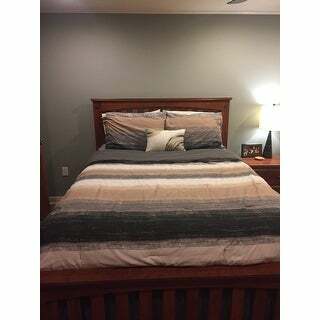 A great bed set I love and get many compliments. No its more of the grey. "How many pillowcases come with the full size set. This is for my guest bedroom so I do want it to be complete"
I ordered the full size and I got two pillow cases and two shams. "Is that a grey color also in the comforter"
There is a touch of grey color in the comforter in the transition/fade into the other colors. Yes it is. Its very nice! "My fitted sheet ripped, is there a way to order just the fitted sheet?? " Unfortunately, it is only sold in a set. "Why is the queen set more expensive than the king set?" I think there is a difference in price between the quilt set vs the comforter set. "Is the comforter polyester? What thread count are the sheets? Is the comforter reversible?" it don't wrinkle. don't know the sheet count but don't think it is very many/ not as comfortable as some.